Rhinophyma is a bulbous enlargement of the nose with a ruddy complexion and numerous pits along the surface associated with rosacea and overgrowth of nasal tissue. The sebaceous glands of the nose increase in size and number with each surface pit being the mouth of a gland. Although the disease is benign superficial skin infections are characteristic with drainage of foul smelling material. It is 12 times more common in men than women. The best treatment for severe rhinophyma is surgery under local anesthesia. Health insurance covers the surgery if the overgrowth is so heavy that it collapses the nasal airway. In California the state also mandates coverage if the overgrowth is so great that a lay person looking at the nose would see it as abnormal in appearance. 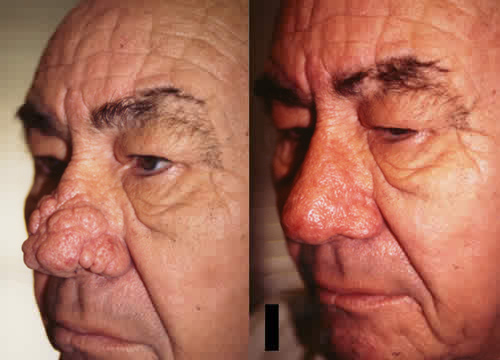 Rhinophyma surgery can enhance your appearance and your self confidence and improve your breathing. Realistic expectations are important to be happy with any surgery. As each patient is an individual, different results can be expected in each patient. For early cases the treatment is non-surgical topical and/or oral medications and laser treatments. For severe cases where the nose is severely enlarged surgery is the only option. In these cases laser is not a good option because the laser ablation occurs perpendicular to the skin surface so it is almost impossible to define an accurate end point. Shaving the tissue off perpendicular to the skin surface starting from the normal tissue level is a much quicker and complete way to treat this. The initial healed skin is not durable for some weeks so if you scratch your nose during this early period after surgery you can create a permanent indent or scar. The skin may also become hyperpigmented (red or a brownish hue) especially if exposed to the sun. This may resolve on its own or require additional treatment with topical medications and/or laser treatments. Since the surgery does not cure rosacea and there is no know cure for it the rhinophyma will return if you do not adhere to a life long regimen of topical or oral medication to prevent its return. It can improve breathing and results in nasal aesthetics that are more harmonious with your overall facial dimensions so others do not stare at your nose. After shaving of the excess skin a raw skin surface will be present for as long as 2 or more weeks. There will be swelling for an indeterminate period. Much of the swelling will normally disappear in a few weeks but the remainder may require several months to disappear completely. Resolution of the swelling may be uneven resulting in temporary asymmetry of the nose. A perforated transparent dressing is applied directly over the raw surface and this is covered with gauze that wicks away any drainage. You change the gauze as needed. The transparent dressing is changed by Dr. Stone every 4 to 7 days until it is no longer needed. This usually takes between 2 and 3 weeks. Once the surface has healed the dressings are no longer required. A topical steroid is applied daily for 2 to 3 months to reduce the redness after surgery. A minority of patients require 1 or 2 flashlamp laser treatments at extra cost to soften the skin or reduce redness more rapidly. For 8 weeks after surgery protect the nose from excess sun exposure with #15 or greater sunscreen and/or wide brim hats. After that topical or oral medications are required to prevent regrowth of the rhinophyma.